My Sweetie's being really good to me this year! She cooked up a favorite meal for me last night –Indonesian Fried Noodles– and today we saw the new Pixar treat: WALL-E. We both loved the movie and, true to form, the fun started with one of Pixar's amazing and outrageously funny shorts entitled Presto. I can hardly wait to see Presto, again… there's so much packed into it. 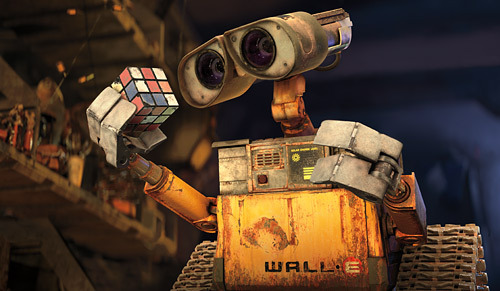 I won't do a movie review here and I don't want to start ranking them but WALL-E is definitely one of Pixar's best. Audiences of all ages can enjoy this one with its mix of fun, action, adventure, environmental concern, and romance. I don't know what else we may do today or if it will be birthday-related but it's been a good one so far! And just what did you think those flags and fireworks were for if not my birthday? I always knew the fireworks were for you, but I thought the flags had something to do with Uncle Sam…. hummm. Your dinner sounds delicious! We hope to see WALL-E this week. Nathan really loved it. I was under the impression that all of the July Fourth festivities were on account of me. Uncle… ?When you go to watch WALL-E be sure to keep an eye out for a lot of little surprises… "Easter Eggs" often visible away from the central action. You'll see bits and pieces from previous Pixar films including Rex the toy dinosaur from Toy Story. Also listen to the sound character Eve makes when she reboots! Apple users get that one instantly! There's so much going on I think you'd have to watch it several times to have a chance at catching everything. Something for just about everyone but I think there's more than usual in this one for techies.Mom really wants to see WALL-E also so I hope she gets to go soon.